Our current South African economy is slowly but surely stifling us; it's an unfortunate reality, but one which we're forced to meet head-on. Prices continue to rise, while our take-home salaries don't – all this leaves us with less financial headroom to be able to fully enjoy quality of life; something which us South Africans are quite privileged to have in our beautiful country. How do we find a way around this problem? Well – we could probably rob a bank, although that comes highly inadvisable seeing as it's the pinnacle of "illegal", and downright silly; or we could use up the little free time we have by doing afterhours jobs, such as bartending or delivering pizzas – but let's be honest; after a long day at the office, the last thing you want to do is to be kept on your feet all night long. The other possible alternative would be to indulge in our South African lottery game events; excepting that we’re met with (let's be honest) rather bland jackpot offerings. What more are we left with? Now, before you throw your arms up in the air and say "Ag no man, not another online scam, come on guys!" we can very confidently assure you that we've done our homework; and that this incredible new service is 100% legit, and what's more, it's been tailor-made for our unique South African market! Approved, licensed and regulated by the Mpumalanga Gambling and Racing Board, LottoStar represents what all South Africans have dreamt of; a platform where we can compete in exhilarating jackpot games, and stand to win never-before-seen prizes for our efforts – and boy oh boy, these jackpot prizes on offer will definitely blow your mind! We're sure you noticed the rather eye-catching "R160 million" part on the image, and we're quite pleased to announce that it's guaranteed – and as real as it can possibly get! 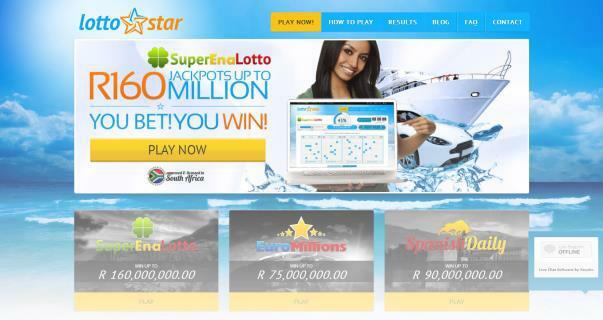 This is all thanks to the SuperEnaLotto game on LottoStar.co.za; but for those who are looking to start off 'small' you are able to participate in the EuroMillions game, where jackpot winnings of up to R75 million can be expected. With flexible gaming options, the power to win is placed directly in your hands – and, for as little as R3.50 for a single entry, you too could be South Africa’s next major millionaire. Deal of the century, in our opinion! Online safety these days is always a crucial deciding factor; after all, nobody would like to be the victim of a scam. The international banking fraternity use a particularly iron-clad 256-bit SSL encryption protocol for all transactions; and thus, it is a great reassurance to know that LottoStar uses the exact same protocol for their service! So, not only are you guaranteed entry into the gaming events, but you can also compete for the guaranteed jackpot winnings with complete peace of mind – oh, and did we mention that you are able to use your smartphone or tablet device to play even while you’re on the move? That's right, as they are online-based, they have eliminated the need to stand in unnecessarily long queues; how's that for unrivalled convenience? This amazing service has managed to tick all the necessary boxes; we know we've signed up – so why not play LottoStar today and experience a completely new realm of winning?